If you’ve always imagined what life would be like if money was no object now is your chance as you experience the luxurious lifestyle enjoyed by the wealthiest people in society! 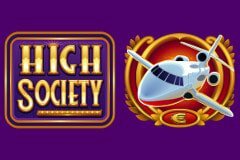 High Society is a 5 reeled video slot containing 25 paylines which can be adjusted and while we have reviewed these types of online slots based on luxury lifestyles countless times before, these blinged-up reels instantly stand out with a city landscape to view as the catchy tune of a piano and saxophone ring out in the background as if you are dining in a posh restaurant. The reels are sparkling with the trappings of riches that the wealthiest people in society enjoy with private jets, luxury yachts, and piles of cash featuring on the reels, and with a maximum win of 535,000 coins available on every spin you could well be enjoying the finer things in life very soon too! The reels are awash with the trappings of riches enjoyed by the most privileged in society, with gold and silver featuring heavily across the twelve symbols that feature on the reels. The sparkling High Society logo is the Wild symbol with the ability to substitute for all but the Scatter symbol, however it only makes an appearance on the first and fifth reels during the base game, while a 100 Euro bill symbol is the Scatter and two of these on the reels at once see you win 2x your stake, while three or more see you earn even greater rewards in addition to triggering the bonus feature. You could find yourself setting off around the world on a private jet for wins worth up to 120x your stake, soaking up the sun on a luxurious yacht for wins worth up to 100x your stake, being escorted in a chauffeur driven car up to 80x your stake, stacking gold bars for up to 50x your stake, stashing bundles of cash into a briefcase for up to 20x your stake, counting silver bars for up to 10x your stake, grabbing money bags for up to 8x your stake, purchasing a diamond ring for a trophy wife for up to 8x your stake, or purchasing a gold watch or a pair of cuff links could see you enjoy up to 6x your stake. The more money, the better, and that is certainly the case on the reels as landing three or more 100 Euro notes at the same time will not only see you receive an instant Scatter win, but also trigger a very lucrative free spins feature. Three notes on the reels earns you 2x your stake, four see you enjoy 20x your stake, while five see you claim 100x your stake, and unlike the majority of free spins features where you are assigned a predetermined number of spins which begin playing out, High Society offers you the choice between two different free spins modes – either Super Wild Reels or Super Multiplier. The number of free spins you receive will depend upon the number of Scatter symbols that you triggered the feature with as three earn you 10 free spins, four see you begin with 15 free spins, and five see you rewarded with 20 free spins and while that sounds generous enough, there will be up to three Stacked Wild reels with the second, third and fourth reels having the ability to turn Wild. If you happen to land the Scatter symbol on reel one or five you will also see that reel turned Wild too, while landing the symbol on both will turn them Wild plus see you enjoy an additional 10 free spins. The Super Multiplier mode sees you receive 10 free spins with a starting multiplier bonus of 2x if you trigger it with three Scatter symbols, a 3x multiplier if you landed four Scatter symbols, or a 5x multiplier if it was five Scatter symbols and each time you land the Scatter symbol on reel one or five it sees the multiplier value increase up to a maximum of 6x, 10x and 10x respectively, plus landing a Scatter symbol on both the first and fifth reels sees ten more free spins added to your counter. It’s yet another online slot with a luxury theme and it will definitely leave you wanting to join the high society and mix with the richest people, however the potential wins won’t necessarily afford you the lifestyle where money is no object and you should instead check out the Mega Fortune slot machine from Net Entertainment which boasts a progressive jackpot that is often worth millions!